DoD News Briefing with Robert Hale and Vice Adm. Steve Stanley from the Pentagon Briefing Room, Arlington, Va.
STAFF: Well, good afternoon. Welcome. It's good to see such a turnout for our budget briefing. 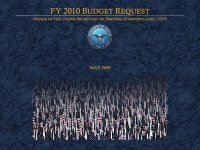 As you know, today President Obama submitted to Congress his Defense budget request, his budget request for fiscal year 2010. And in the coming days Secretary Gates will be discussing this request before the Senate and House Armed Services Committee. Secretary Gates is not with us today, since he is traveling in Afghanistan, visiting with commanders and troops. He did, though, in the past couple of weeks have the opportunity to discuss with you many of his major budget recommendations at that point. Today, though, we are very fortunate to have with us Under Secretary Bob Hale, the department's comptroller and chief financial officer, and Vice Admiral Steve Stanley, the J8. For those of you who don't know, that's the director for force structure and resources for the Joint Staff. 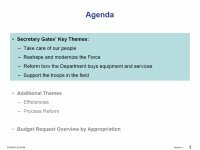 And they will be able to provide you with an overview and detail on the DOD budget overall. Following their briefing, we have a series of briefings that will take place by the military departments. 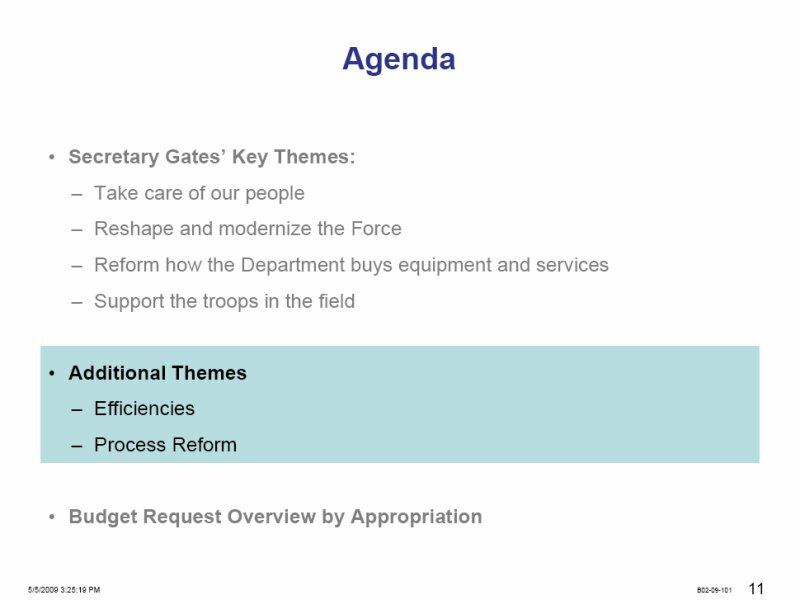 We will take a short break in this room to reset with new briefers and start with the Army at approximately 1:30. The Air Force will conduct their briefing simultaneously upstairs in Room 4E869, if you want to go up to the Air Force briefing. In here will be followed by -- the Army will be followed by the Navy and Marine Corps at 2:30, and the Missile Defense Agency at 3:30. So it's budget all afternoon. And with that, I'd like to ask the comptroller and Admiral Stanley to come up and give you this overview. MR. HALE: Thanks. Well, good afternoon. With Admiral Stanley, I hope that we can run through a short briefing for you. I'd appreciate if you'd let us get through it. We'll try to, I hope, to answer some of your questions in advance, and then we'll try to leave plenty of time to then answer the others that you have. This is a reform budget. I've worked on defense budgets three decades or so now; we sometimes use that phrase loosely. But I think a handful of budgets qualify, and this one does. I agree with the statement that you see up there from the Secretary of Defense. If approved, I think it will change the way we manage the Department of Defense. And I hope in the next few minutes we can explain why that's true. Let me start and live up to my reputation -- next slide, please -- as a comptroller by giving you a few numbers. 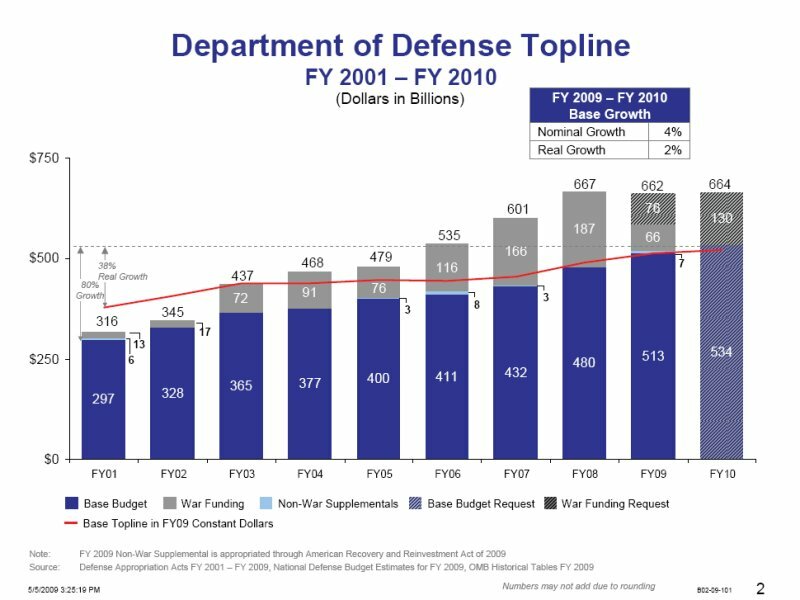 This shows you the defense budgets back to 2001 up through 2010. We're asking for $664 billion of budget authority in fiscal year '10, about the same -- (coughs) -- excuse me -- as the last couple of years. What has changed is the mix. Top part of that bar is our wartime budgets. They've gone down. 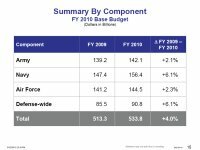 The base budget, everything else, if you will, has gone up. And if you -- you can't tell from the slide, probably, but between 2001 and 2009, the average increase in the base budget has been about 4 percent after adjustment for inflation. This one grows 2 percent after adjustment -- inflation, between 2009 and 2010. 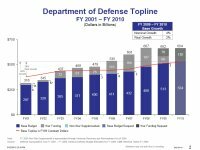 And I think that bears out the statement Secretary Gates has made that the spigot of defense spending, which opened wide after 2001 (sic), is starting to close. We're going to focus on 2010. Let me just say one more thing, and that is, we don't have a plan right now beyond 2010. 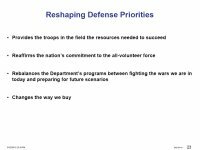 That plan for 2011 and beyond needs to await the results of the Quadrennial Defense Review that's going on right at the moment, and also the fiscal '11 Program and Budget Review. So I'm not going to be able to answer your out-year questions, but we can tell you a lot about what we're doing in 2010, and let's turn to that now. Next slide, please. 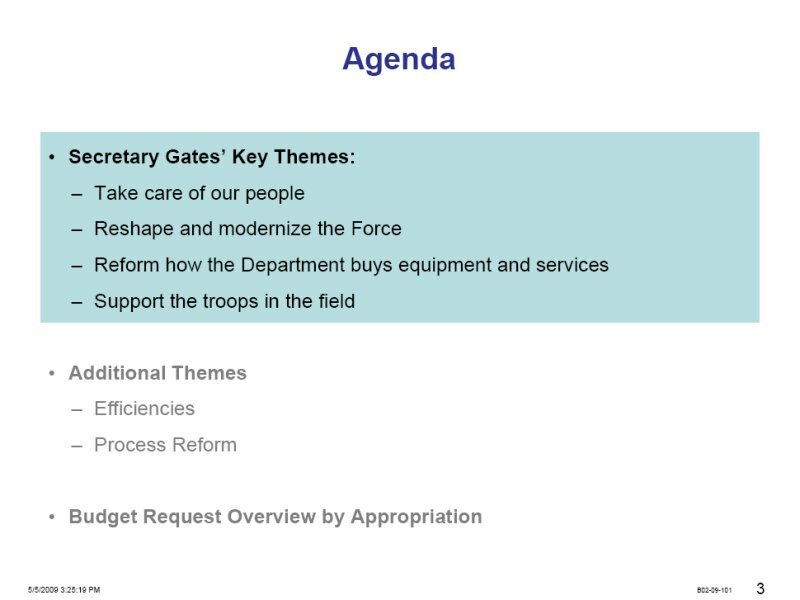 Secretary Gates said -- he was emphatic at the beginning of this budget debate -- he wanted this budget based on strategy and themes, so we're going to describe it using his themes, I think crafted in his own words, really -- the ones in the blue box, there, the four of them -- and also fully agreed to by the chairman of the Joint Chiefs, Admiral Mullen. 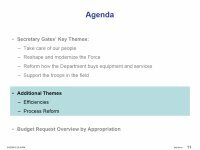 After we finish that, there are two other themes I want to mention, I think, consistent with the overall administration goals about efficiencies and process changes. And then, living up to my reputation as a comptroller, we'll finish up with a few more numbers that I hope will give you a different kind of insight into the budget. 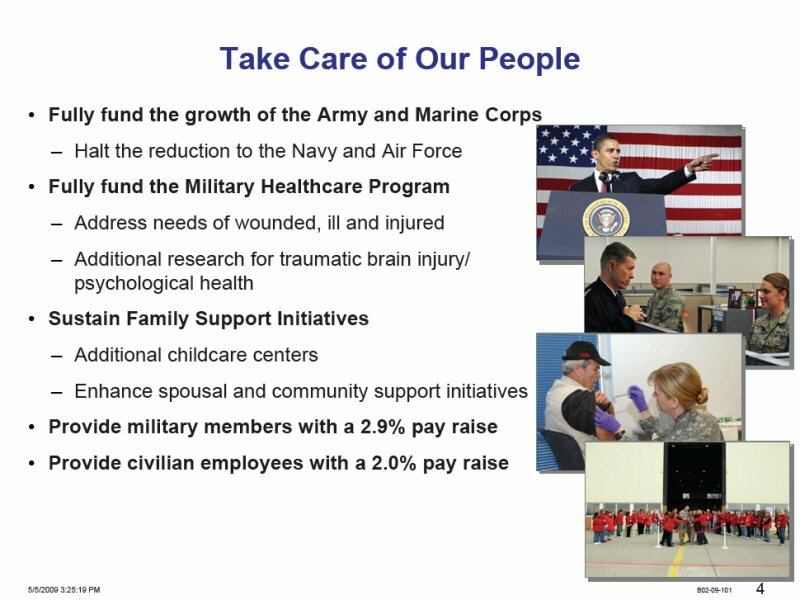 Let's turn to the themes, starting with taking care of our people -- next slide, please -- the most important theme of all. Without our people, we obviously would not succeed, and we've done a number of things in this budget to try to take care of people. We have fully funded the growth of the Army and the Marine Corps. They are now at their higher levels and are fully funded in this budget. 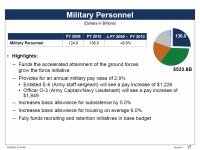 There were reductions going on in military personnel in the Navy and Air Force. We have halted those in light of the demands on those services. 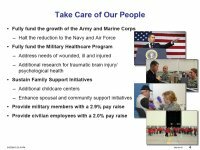 We've fully funded the military health-care program at $47 billion, and funded research programs aimed at brain injury and other key problems for our wounded, injured and ill soldiers; and focused on those men and women who have served us so well, devoting $3.3 billion to things like creating new warrior transition centers; a pay raise for the military at 2.9 percent; and, consistent with a raise for overall government employees, our civilians would receive a raise of 2 percent. Taking care of our people -- our most important theme -- I'd like to pause, because it's -- and let Admiral Stanley give you his views on this from a uniform perspective. VADM. STANLEY: So what I would like to try to get across is the idea that the chairman supports; this is the highest priority for our nation. 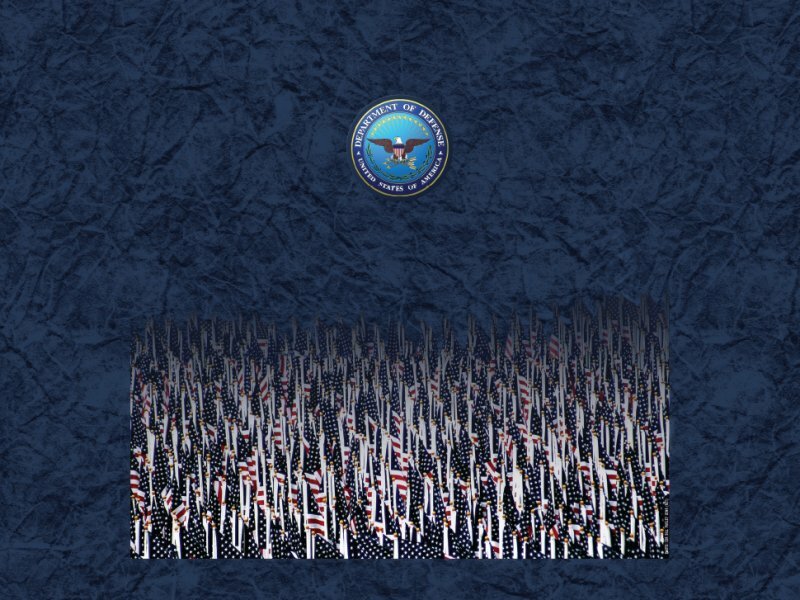 It's strongly supported by all the Service chiefs -- clear recognition that the strength of our nation is based on the ability of our people to go forward and defend our way of life. What I think you see here, when you get into some of the details, is the strength of this request in supporting our people. The funding is now -- it's no longer in the -- what we used to call the supplemental, the war cost today -- we've brought that down into the base. This is a long-term commitment by the department to take care of our people. The wounded, ill and injured initiatives are now all base-funded. So those people that have gone forward and have been affected in a negative way by the combat that they've been faced with -- we're going to take care of them. We're going to take care of the families and the people that -- some of our soldiers, sailors and Marines and airmen have left behind. So this is a long -- an issue of long-term commitment to the importance of our people. Second key theme is to try to reshape the military to have more capability to fight irregular and unconventional war while maintaining a balance of conventional capability, and modernize with those themes in mind. A lot of adds here -- for example, additions to help build partnership capability; train and equip our allies, so that they can defend themselves; growing Special Operations Forces -- these people are key to irregular and unconventional war. 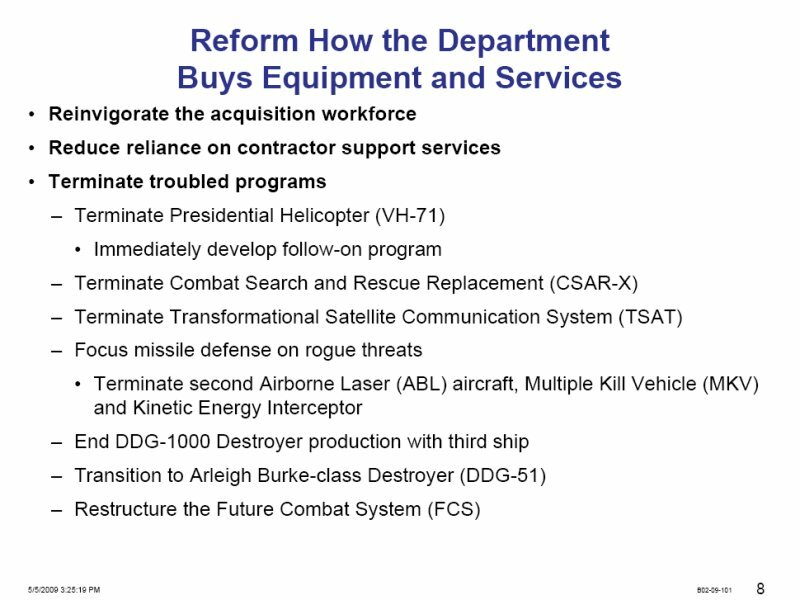 We've added 2,400 Special Ops personnel or will in fiscal '10, and recapitalize some of their programs like gunships. We've got enough helicopters, but we can't always get them to where they need to be in the fight. Because we lack crews, we're adding 150 -- our capability to train 150 more crews, starting in fiscal year '10. Buying several kinds of ships -- littoral combat ships and the Joint High Speed Vessel -- that serve well in irregular war. And we've stopped the growth of Army brigade combat teams at 45, rather than going to 48, to fully man these units within a given end strength, so that they're ready at a moment's notice to fight. 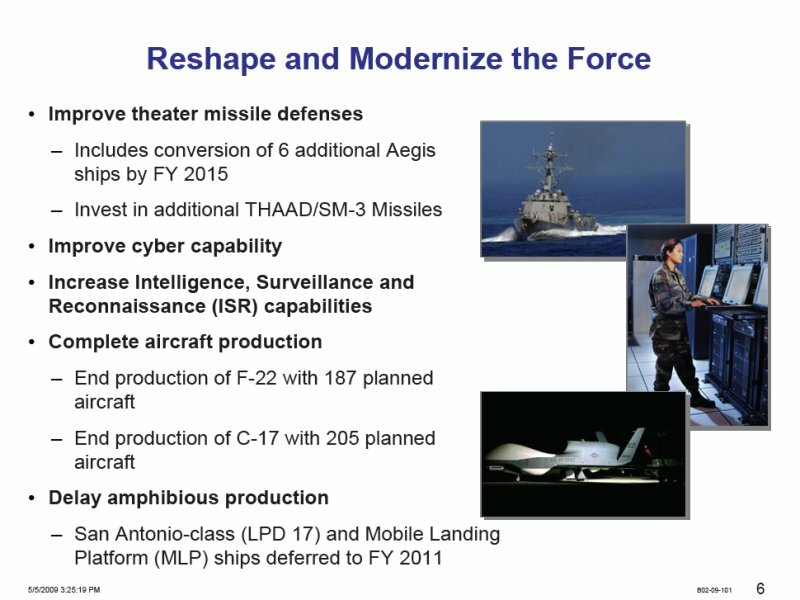 We've improved our theater missile defenses by outfitting additional Aegis ships, six of them by 2015, to have theater missile capability, and some other changes. Cyber capability, key to irregular war. Networks get attacked. We need to defend them. We need an offensive capability. We're going to train 250 cyber experts, up from about 80 today, starting in 2010. And intelligence, surveillance and reconnaissance capability. You can almost never have enough in these kinds of wars. We'll make a variety of increases; for example, in our Unmanned Aerial Vehicle programs. 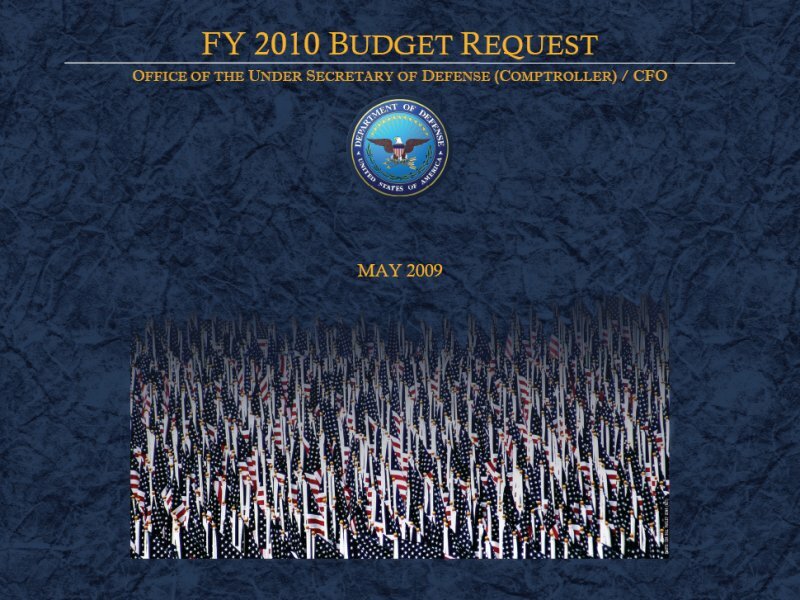 We've got to pay for all of this, so there are some cutbacks, or, in the case of the F-22, really completing the program of record at 183 planes, plus the four that are in the '09 supplemental, for 187. We believe that is enough of these high-capability aircraft to meet the high-end threats. And same with the C-17, ending with the 205 planes that are on order or are in the fleet, along with our C-5s: we think enough to meet our airlift needs. And delaying some amphibious ship production really until we have a chance for this Quadrennial Defense Review to look at amphib capability, how much we need. 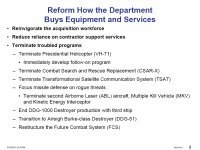 We talk about cutbacks, but there's a lot of modernization going on in this budget, both for irregular and unconventional war, and also a balance of conventional capability. The biggest one, the Joint Strike Fighter, we'll invest $10.4 billion in buying those aircraft, 30 of them, in Fiscal Year '10, plus research and development. Nine ships: eight in the Navy, one in the Army. You can see the list up there of the vessels that we'll be buying. Tankers are key to everything we do. We will continue and maintain the planned KC-X Program, with the hope of having a contract award by next spring. And various other programs, like the C-130 recapitalization and some satellites, we'll mention later. Reshaping the military to fight, or to focus more on irregular and unconventional war: a key goal of Secretary Gates. And I think a lot of this budget is aimed at doing just that. We also need to change how we buy and what we buy. And there's both people changes here and hardware changes. On the people side, we need to reinvigorate our acquisition workforce. It's too small, and too much of it has been -- relies on contractor support. We're going to add about 4,000 additional government civilians in 2010. Roughly 1,600 of them will be new government employees, the others -- or will be additional people, I should say. The others will replace contract personnel. And we will rely less on contractor support services. We've grown to about 39 percent of the support service workforce being contractor. We're going to move back to around 26 percent, consistent with the pre-2001 level. That will mean hiring another roughly 13,000 government civilians in 2010 and using them to replace contractors. On the hardware side, we took a long look at programs that are having trouble, either in terms of cost, schedule, or technology. And the secretary was adamant: Enough on the studies; we need to take action. And he proposed a number of those. Terminating the presidential helicopter, which has more than doubled in cost and is well behind schedule. We know we need additional helicopter capability to transport the president. And so we will immediately restart a program, but hopefully with more focused requirements. Terminating the Combat Search and Rescue helicopter. The so- called CSAR-X has had a troubled acquisition history. But the key problem here is -- it's a single-Service mission or a single-Service capability, focusing on a multi-Service mission. All of our Services need the potential to rescue pilots and crews sometimes during combat. We'll terminate this program, try to move it to a multi-Service program. 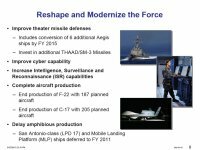 Focus the missile defense program on rogue threats and theater missile defenses. This is a big one. 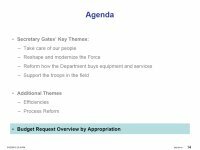 Overall we will decrease the MDA budget by $1.2 billion between '09 and '10 with a strategy of, as I said, focusing on rogue threats. So for example, we'll terminate the Multiple Kill Vehicle, which is really oriented more toward threats larger than rogue-state kinds of threats. We'll terminate or limit to 30 the number of ground-based interceptors in Alaska and California. And we'll terminate the second of the Airborne Laser (ABL) aircraft but keep the first one, to continue research and development on boost-phase activities, like ABL is designed to do. And finally a major restructuring of the Future Combat System – the Army's Future Combat System. We will try to exploit the spinouts, the technological developments, already accomplished in that program, things like the warrior information network, by putting them immediately on existing assets, existing Army assets, but terminate the ground vehicle program and relook at it, in light of what we're learning that we need, in Iraq and Afghanistan and similar unconventional and irregular wars. So the Army will relook at that program and start it again at some point, with that thought in mind and taking into account the more than $25 billion we've spent buying Mine Resistant Ambush Protected – MRAP – vehicles. How will they play in Future Combat Systems? Next slide. The last of the themes I want to mention: supporting our troops in the field. This we do largely through our overseas contingency operations or OCO – Washington’s newest acronym. 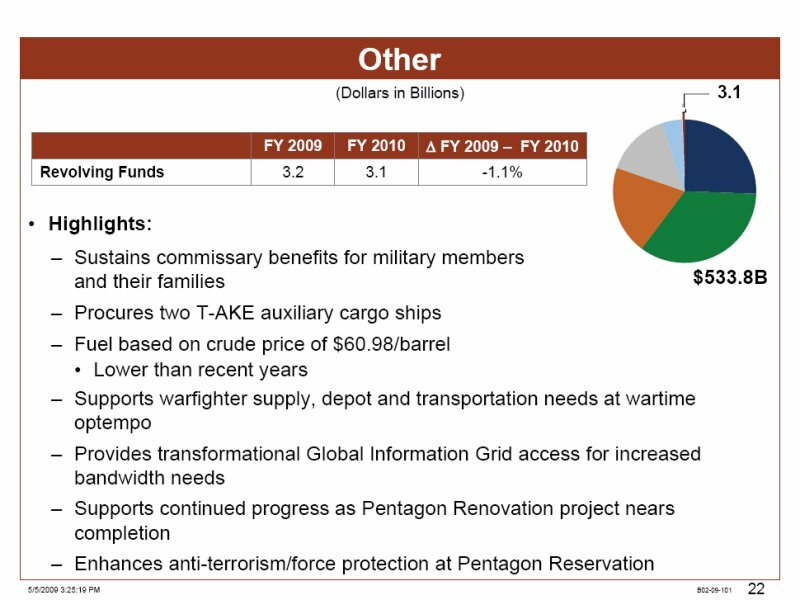 We're asking for $130 billion to fund wartime activities in fiscal year '10. You can see, 80 percent of it or so is what we call continuing the fight. It's added tank miles. It's paying for the reserves that are mobilized, to fight in Iraq and Afghanistan, and a variety of enablers. This is an area where obviously the military perspective is key. 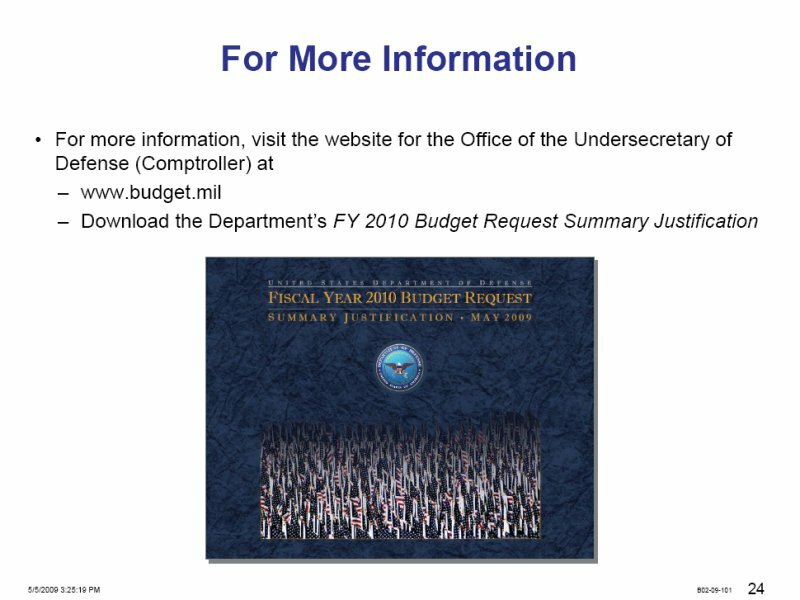 So I'm going to ask Vice Admiral Stanley if he'd talk to the next slide, please, about some of the specifics that are in this OCO budget. VADM. STANLEY: So what I'd like to get across is the idea that the national security team has really worked this problem hard. And this request is where you're going to first see the swing, of not only dollars or resources but combat capability, from the Iraqi theater into the Afghan theater. 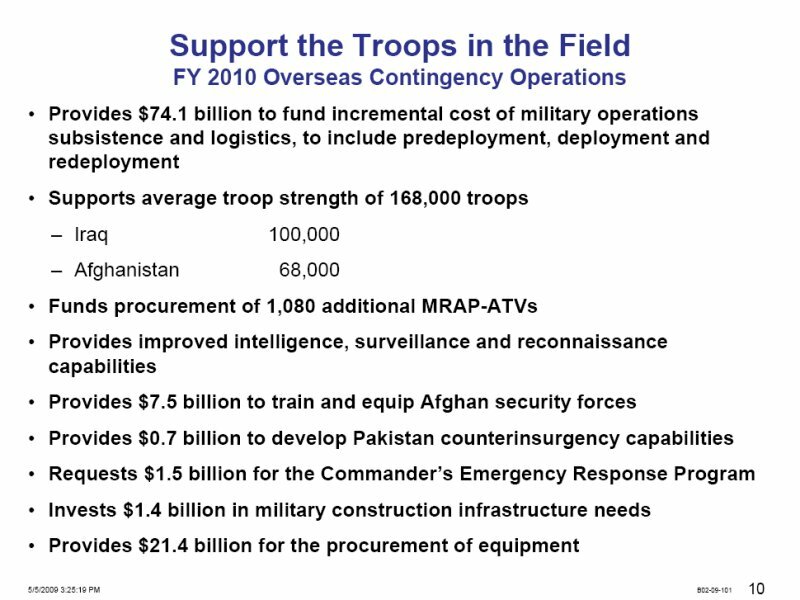 And actually you'll see in this request that the money requested here, about $65 billion for Afghanistan, actually exceeds the $61 billion that we're requesting for Iraq. So that's the first time in our war cost request. So as this swing starts -- as you start to see the swing, I'd like to emphasize a couple things on the chart. First is the MRAP, the Mine Resistant Ambush Protected all-terrain vehicle – an important initiative. And what I want to cast this in is -- this is how we're trying to be responsive to some of the pressure that the secretary has put on us to try to get the combat capability into the theater that our warfighter is demanding. Now, specifically for the MRAP ATV vehicle, the MRAP has been very successful for operations in Iraq, though as we started to swing over into Afghanistan, what we found is we needed a capability that was lighter, more maneuverable, capable of dealing with the road situation in Afghanistan. So in the FY '09 request, we've requested money to start this MRAP ATV variant of the MRAP program. We're continuing that in the FY '10 request. But it's very important because we need to rapidly deliver this combat capability to General Petraeus and McKiernan in Afghanistan. The next issue I want to highlight is the $7.5 billion for training and equip of Afghan security forces there. What that does will allow the growth of the Afghan National Army to about 134,000 and the Afghan National Police up to about 86.8 thousand. And again, very important -- those are critical capabilities. 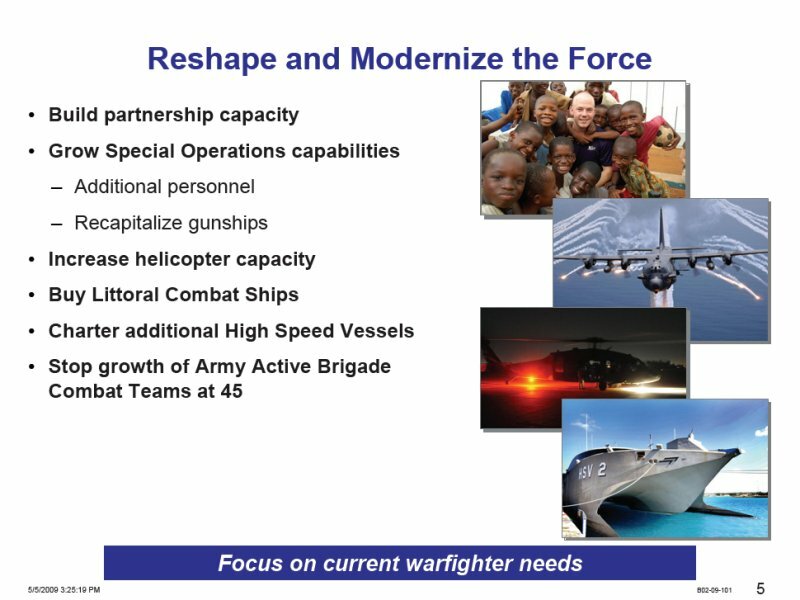 The warfighter is demanding the authority to grow these forces. And it's our key to getting out of Afghanistan in the future -- establishing the right security environment in Afghanistan to allow our forces and our NATO allies to draw down. I'd also emphasize the next bullet there, the Pakistani Counterinsurgency Capability Fund, PCCF. Again, we've actually requested this authority in the FY '09, and we're continuing this request in FY '10 -- a critical authority for General Petraeus. How are you going to deal with giving our Pakistani allies the capabilities they need to help deal with the border situation between Pakistan and Afghanistan? This is the authority that we need to do that. And again, this is responsive to the secretary's priority that he's placing on winning the war you're in -- getting that commander the authority that he needs to deal with the situation he's been presented in this irregular warfare conflict. And lastly, I would emphasize the Commander's Emergency Response Program there. 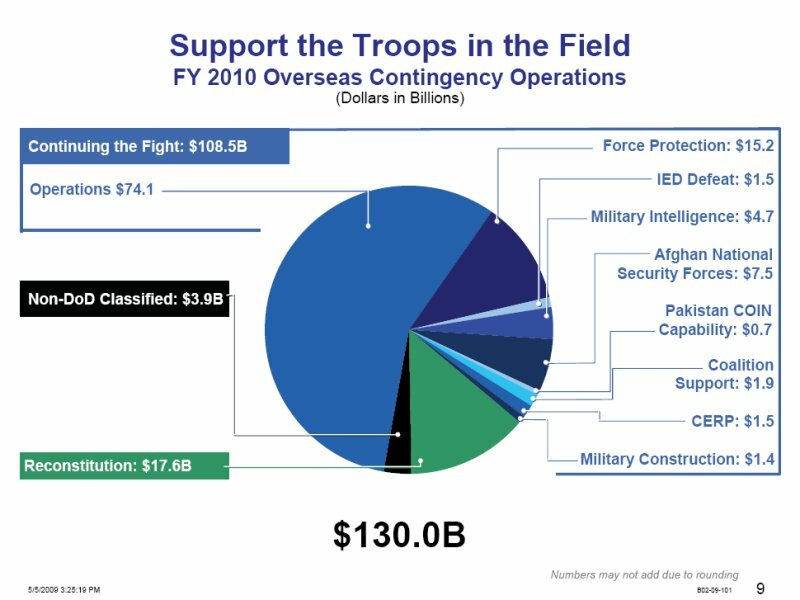 You see $1.5 billion -- huge shift in that program from where we were, invested almost entirely in Iraq, to this year -- FY '09 -- where it's about a split -- it's about $700 million in Iraq and $700 (million) in Afghanistan -- to now $1.2 billion of the $1.5 billion request in Afghanistan. But again, an enabler for irregular warfare in Afghanistan, and you see the priority that the administration is placing on that, in this request. We've covered the four themes that mainly characterize the budget. Two others, quickly -- next slide -- that are consistent with the administration's overall goals. One of them is to seek efficiencies. I spoke briefly of this in-sourcing initiative. Don't get the wrong message here. We need contractors to run the Pentagon. We always will. But we think the Pentagon -- or the pendulum has probably swung a bit too far. We're going to come back, hire some more government employees and use them to selectively replace some contractors, and we think some savings are possible. We also think we can reduce our dependence on time-and-material contracts, which tend to have high profit rates, in selected areas, realize some savings. And given the state of the economy, we can make selective reductions in recruiting and retention bonuses and also the recruiting program and still meet our retention and recruiting goals. Next slide? 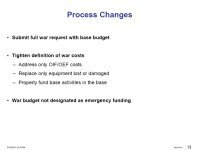 We made some process changes, as well, a key one to submit the full war request, the OCO budget, as we call it, with the base budget. This is not a supplemental. It's not that we've had the budget approved and we're asking for more. We are submitting it as a part of the budget separately, but along with it, a major process change. And we also tightened the definition of what goes into war costs, really focusing only on the added costs associated with the wars themselves. 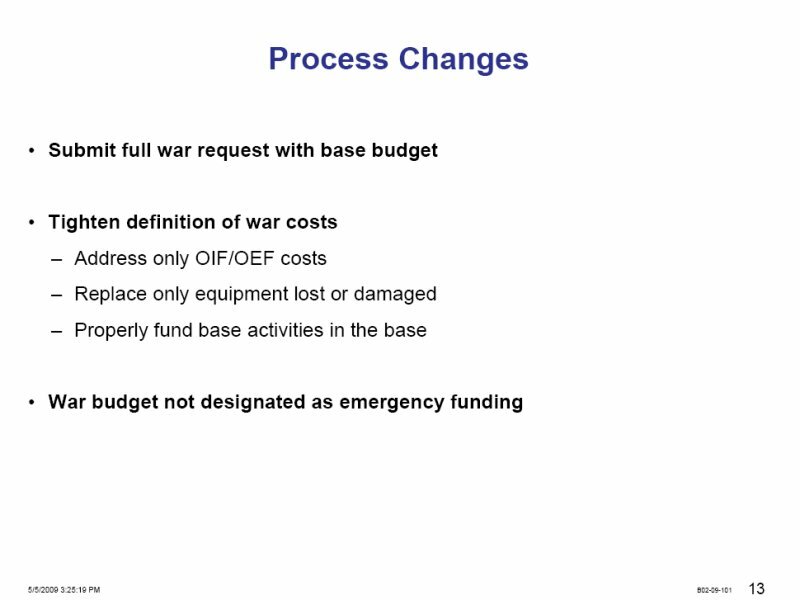 And finally, this war budget is not designated as an emergency, it's kind of insider baseball, but it will subject it to the budget resolution limits that govern the debate on Capitol Hill. 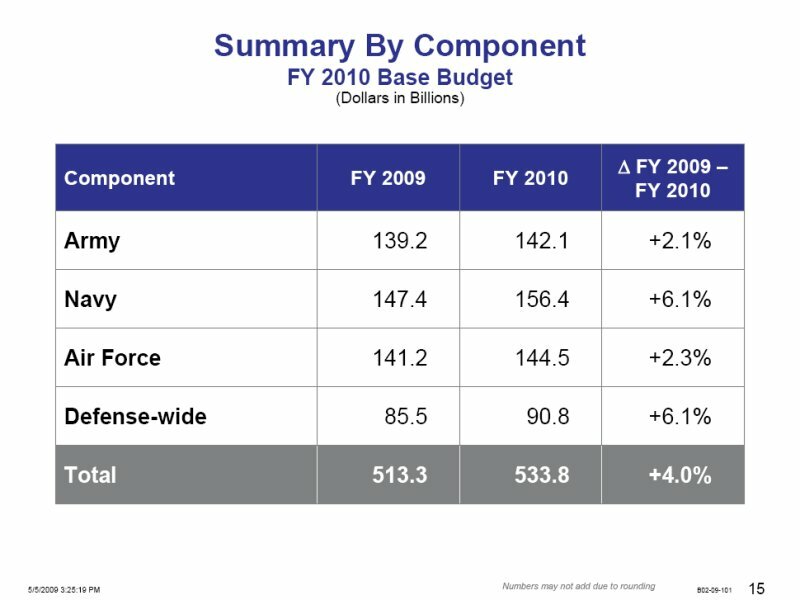 We didn't establish this budget or determine it based on Service shares, but I wanted to show you how it came out, which is slightly higher growth for the Navy, largely because of large increases in the Joint Strike Fighter, the new P-8 aircraft program, shipbuilding, and substantial large increases for the defense-wide programs, that one really driven by the large growth in the defense health program, in our health-care funding. 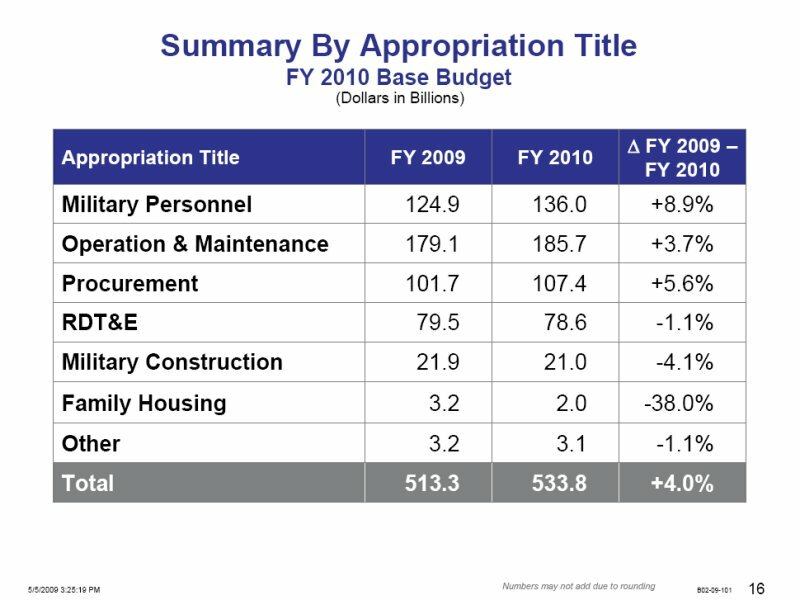 By appropriation title, largest gainer here was military personnel, big cuts in something called family housing. I'll run through each quickly, try to give you insights. Military personnel pays for pay and benefits, as you won't be surprised. 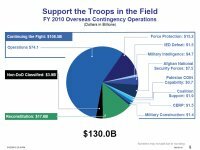 It's up sharply because we are seeking to fully fund a larger military, especially a larger Army and Marine Corps, which really drives the majority of the increases in military personnel. 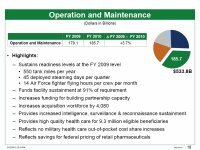 The Operation and Maintenance Account, called the "all other" account of defense budgets, it's got everything from civilian pay to fuel to spare parts to headquarters. I think the key thing here is we designed this budget to maintain current readiness as measured by broad indicators like tank miles and steaming days and flying hours. Procurement. You might say, "Well, we terminated a lot of programs; procurement went down, right?" Wrong. It actually went up. 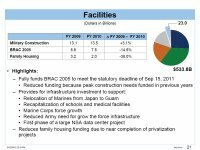 In fact, it went up faster than the overall budget, 5.6 percent compared to 4 percent in the budget as a whole. 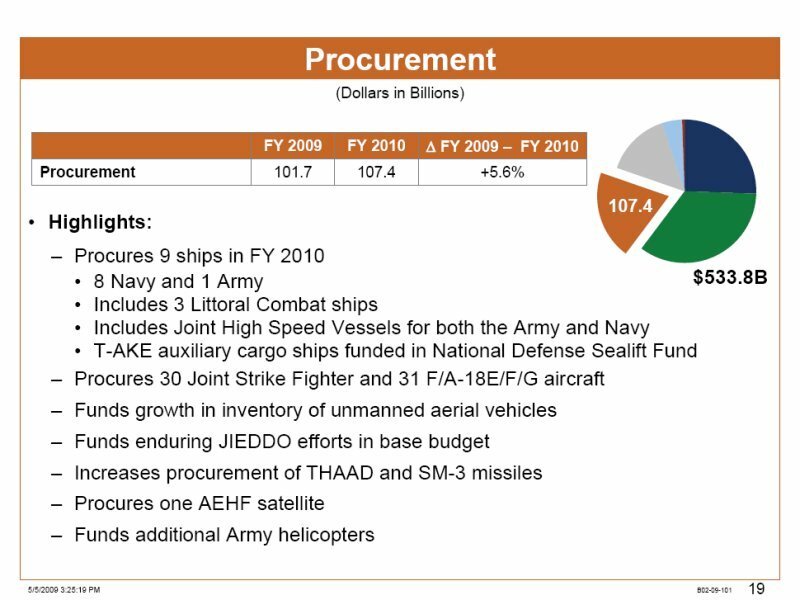 And that reflects heavy investments in programs like the Joint Strike Fighter, the P-8 I've mentioned, shipbuilding, the Advanced Extremely High Frequency Satellite, and some of the smaller procurement programs. 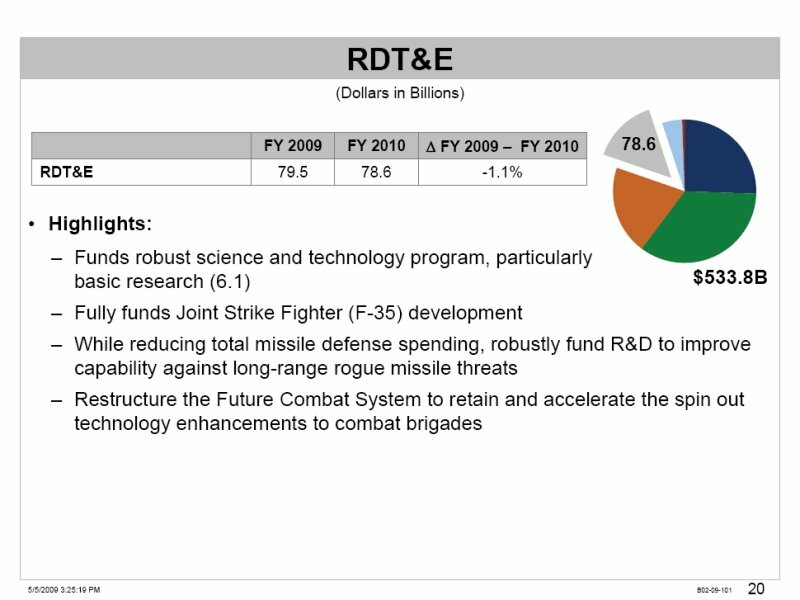 RDT&E went down slightly, reflecting some of the terminations of programs like TSAT and FCS -- had pretty heavy RDT&E, but we've maintained a robust science and technology program, particularly basic research, which grows faster than the overall budget. As far as facilities -- next slide -- military construction actually up a little bit, if you exclude BRAC and family housing, the Base Realignment and Closure 2005 coming down as we complete that program, and we are on track to complete it by the legally required deadline of September 2011. You might look at family housing and say: What's going on here? This is actually a cut that's a success story. We have focused on privatizing family housing, having private companies build them and then our military personnel essentially rent them. So our needs for family housing are going down, hence the large cut in the construction funds. And then there's the other budget, which I won't go through, down slightly. 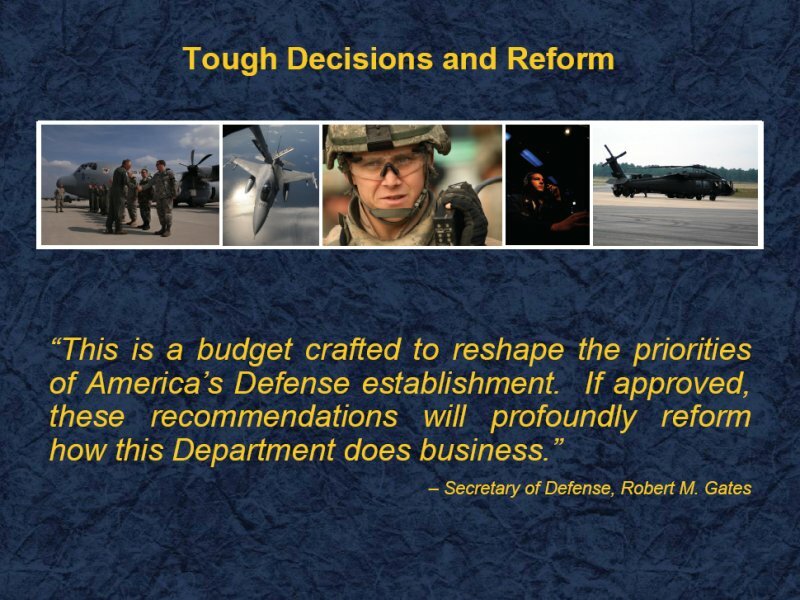 But I will -- next slide, please -- just go back to where I started, which is, this is a reform budget. We're trying to change the way the department does business, focus more on irregular and unconventional war, and change the way it buys goods and services. And if you haven't had enough numbers, there's a website up there, and we can inundate you with further numbers. 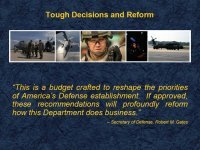 There's an overview book and a variety of -- we call them the dash-1s -- that have got unending detail about this Defense budget. So with that, Admiral Stanley and I will stop and we'd be glad to answer any of your questions. Q In the slide it says support troops in the field -- it said Iraq, 100,000. Does that mean the Defense Department is budgeting to have 100,000 troops in Iraq through the end of fiscal '10? VADM. STANLEY: No. What we've done in this request is, we're requesting an average force level for FY '10. And right now the average is about 100,000 in Afghanistan, as an average, so we're starting higher and we're coming lower. VADM. STANLEY: Yeah, Iraq. Did I say Afghanistan? Sorry. And 68,000 in Afghanistan. So again, if -- that's the opposite slope. So those are average numbers. Now what the exact split is between Iraq and Afghanistan at the end of the year or in, you know, June of that year, we'll sort that out as we work with the commander, based on the conditions on the ground. MR. HALE: Our war budgets are consistent with the president's policies in Iraq. Q If I could back up, ask a quick follow-up, there are about 130,000 troops in Iraq. Where does the 100,000 number come from? VADM. STANLEY: Again, it's based on -- as we looked at the current plan from the combatant commander, the average for the whole year is about 100,000. MR. HALE: -- it's an average. VADM. STANLEY: It's an average. MR. HALE: Does that make sense? You're looking at me quizzically, or us. VADM. STANLEY: It's the slope. We picked a midpoint on the slope. There are lots of plans in the Pentagon. What I'm showing you is '09 to '10. That's $1.2 billion. We actually had a notional plan that had it slightly higher back last fall, and I think he was referencing that. But the $1.2 (billion) is where we are. That notional plan had no particular standing. MR. HALE: No. There were no significant changes in this budget between April 6th and what we're showing you today. Q And what are you doing about funding for the construction of missile defense sites -- proposed sites -- in Poland and the Czech Republic? MR. HALE: We have continued the -- the plan. They're awaiting, obviously, political negotiations as to whether that's viable. But the funding is -- would support it if the negotiations permit that. Q So what's the status of the funding, then? It is frozen, or? MR. HALE: No, it's pretty much the same as last year. We had some unobligated balances which we are using or will use in '10 if negotiations go forward. But we have the money in there to support them if the -- if the negotiations are successful. Q (Off mike) -- had another question, but just to make sure on that, the European capability, it looks like in the R-docs the radar and interceptors in Europe were zeroed out and there was a new line added called "European capability" with $50 million. So does that indicate that you've pulled away from the radar and the interceptor? MR. HALE: I don't think there's any change of -- I'm looking over at John Roth, who's my main numbers guy. I don't think there's any change. As I said, I mean, we obviously recognize that there are some delicate political negotiations going on. But the secretary is adamant that we maintain the resources such that, if those negotiations are successful, we can move forward. And there were some unobligated balances which we are depending on if those negotiations are successful. But we have the funds to move forward if they are. VADM. 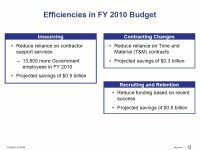 STANLEY: So the FY '09 unobligated balance allows us to reduce the FY '09 program to achieve the same capability if we're successful in the negotiations. But you really ought to have a more detailed discussion with missile defense, you know, in the breakout section on it. Q And if I could, I -- but -- that was a follow-up. But I'm curious, why is it that why the JASSM program is not terminated and it's now in its third year of performance and reliability problems, when other programs have been terminated for a much less, sort of, you know, offenses? MR. HALE: Well, I mean, it was one of many programs we looked at, and all I can tell you is the bottom line was to continue it. Steve, do you have things to add on that? VADM. STANLEY: Very critical warfighting capabilities. From a capability perspective, we need this. We thought that when we looked at reliability, there was a viable way ahead to achieve the reliability that we required. So we made a decision to allow the program to continue. Q Bob, I want to go back to what you said at the very beginning. You called this first a reform budget and then you said, but we don't know where we're going in 2011 because you haven't gone that far yet. So can you explain a little bit to me how this is a reform budget when you don't yet have a path for the next year? MR. HALE: I think so, or I can try, which is, we have invested heavily in 2010 in moving this budget toward more support for irregular and unconventional war. 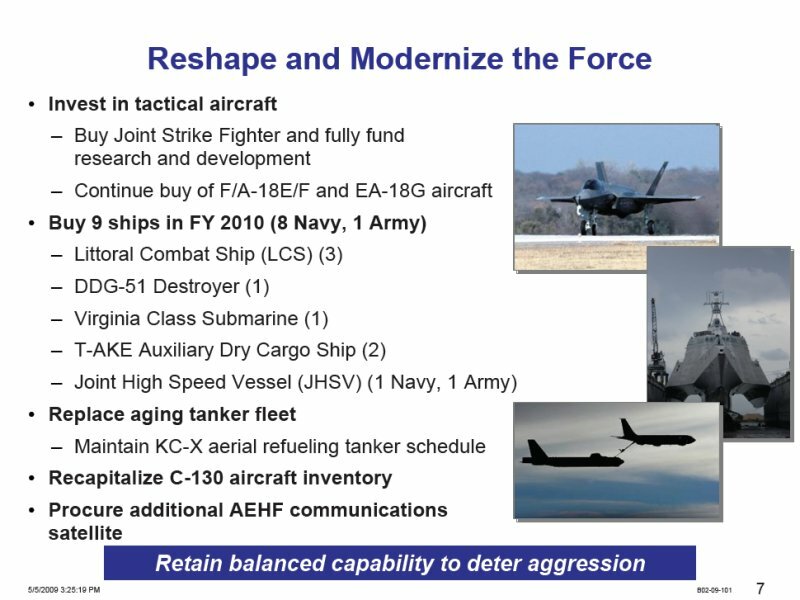 All the things that I showed you on the slides I won't repeat, but it's the added special operators capability, for example; it's added littoral combat ships to HSV, so forth, the things that you saw on the slide. We don't yet have an out-year plan. I would expect, with the secretary's commitment to this, that you will the out-year plan continue to make these kinds of reforms. But frankly, until we get the results of the Quadrennial Defense Review and the program review, we just don't have the details of the out-year plan. We've also tried to change the way we buy things, including a number of terminations of troubled programs, and I think that review will also continue in 2011 and beyond. Q Sir, the admiral talked about the CERP funding. 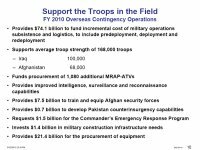 Can you talk about any other ways in which the baseline budget reflects President Obama's transition to Afghanistan specifically, away from Iraq to Afghanistan? VADM. 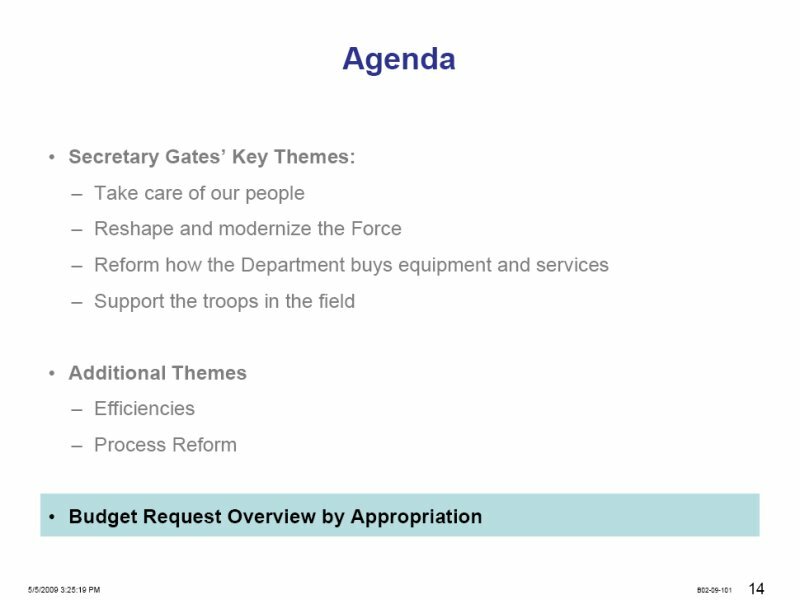 STANLEY: Well, a big piece of it is growing the ground forces, right, because all that force that we have there is now funded, you know, in the base program. The other thing I'd point to is the change in the Future Combat System. Specifically, he's after trying to integrate the lessons learned from these conflicts into the future ground vehicle for the Army. 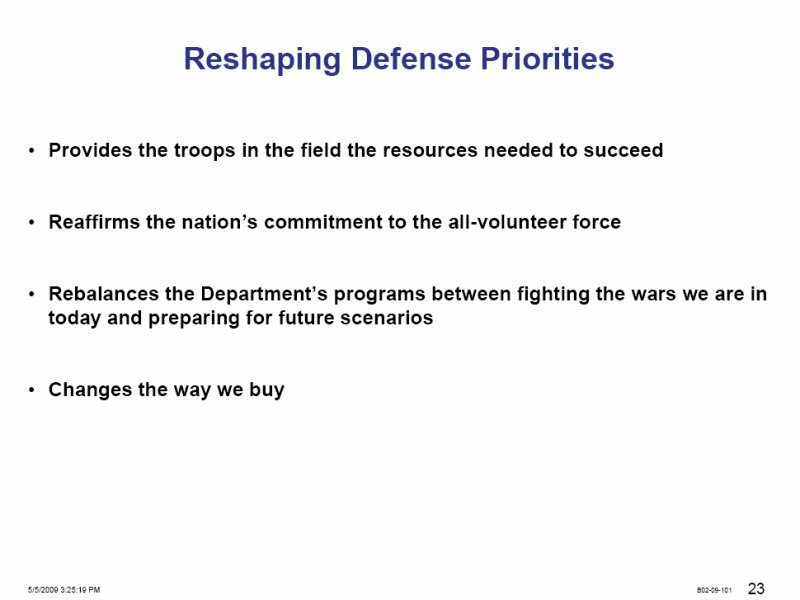 You see that in his -- in his talk when he talks about how the MRAP is going to be brought into the -- how we provide vehicles for our ground forces. Q Are you able to break down that $700 million for Pakistani counterinsurgency and training that is also on there? MR. HALE: Oh, you're talking PCCF fund, Pakistani Counterinsurgency Contingency Fund. You mean what that is going to be used for? MR. HALE: Well, it's modeled after Iraqi Security Force Fund and the Afghanistani Security Force Fund, where the combatant commander -- depending on how this is authorized on the Hill -- because, again, this request is pending in FY '09 -- our intention would be to have the combatant commander have a fair degree of flexibility to both procure the equipment and the -- you know, the capacity to train -- so equip and train -- our Pakistani allies to address the counterinsurgency problems. Q You've talked a lot about the cutbacks and the terminations that Defense Secretary Gates mentioned earlier this year. 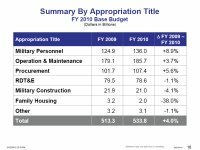 Are there any cutbacks or terminations that were not part of that announcement but are in this budget? And could you discuss those? MR. HALE: I can't think of any. Well, you know, I hesitate to say that it's a huge budget, but I don't think there were any significant ones. Q What about Kinetic Energy Interceptor – that’s been terminated -- can you talk about why? MR. HALE: Sure. It was having technological problems. This is -- it was another boost phase missile defense, potential weapons systems, having technology problems. And so we have zeroed out the funding for it in fiscal year '10 and have terminated the program. Q The Air Force is taking over the Joint Cargo Aircraft program. And I'm curious why the Army, who initiated the program, was sort of taken out of that mix. MR. HALE: We'll talk about the JCA. What we're looking for in transferring that to the Air Force is to exploit some synergy between the C-130s, particularly the C-130s the Air Force has, and the JCA. They have, in some cases, at least similar capability, and we think if the same Service is operating them we'll get more commonality and we'll get more capability for the same expenditure. Do you want to answer the second one? VADM. STANLEY: What we plan on doing is using the MC-130Ws, which is the most -- which is the quickest way that we can provide this capability. These are already -- they're aircraft that exist. They're already plumbed for the refueling capability which will provide them, the time on station that the -- in this case, the SOCOM requires. And so that's the fastest way to get it. So that's why we went that path. MR. HALE: We're going to buy 38. There was plans in the past to buy 78. Q The CSAR helicopter, if you're shifting it from the Air Force to the Joint Services, how are you saving money that way? That's not really a cancellation, is it? VADM. STANLEY: It's really more of a mission issue, right? So who is going to have this mission? We were on a path to have this long-range combat search and rescue mission be done by a single Service. What the secretary -- and again, considering the acquisition challenges that this program has faced -- what the secretary challenged the JROC to do is go back and rethink the concept of operations. 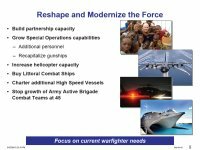 How can we provide this capability, which everybody recognizes we need, but it may not be a single-Service, single-aircraft capability? We might be able to use the aircraft we have. For example, the 22 might be a way to provide a similar type capability. Q -- to the other Services that this is going to? Q In terms of presenting this budget to Congress, have you done any analysis of what the net job effect of all the changes that you are making, both the additions and the cancellations in the procurement program? I ask that because Secretary Gates said, in making a choice of reducing the production of F-22 -- he said that as the F-35 ramps up, those jobs will then, you know, be -- will account for some of the job losses in the F-22. So I'm wondering if you've done an overall jobs analysis for all of these programs? MR. HALE: The answer is no. I mean, we look at our job as providing the president the recommendation that gets the most national security for a given amount of funding. And I can tell you, throughout all the deliberations -- and I sat through a lot of them -- there was never any mention of job changes. I will say -- which backs up the secretary's point -- our overall budget is up 4 percent. So, yes, there will be some cutbacks, but there will also be growth. F-35 is an example of one that is growing. And I'd end by saying that, look, folks, I mean, we understand we're affecting people's lives and livelihoods here. We don't see it as our role, but we certainly hope that federal, state, non- governmental assistance will be available to them as they go through this transition. Q Can you talk about that? MR. HALE: They can -- now that the budget is out, they can talk about anything that's other than security classification or pre- decisional information. VADM. STANLEY: Secretary Gates' intention was to prevent leaks so that he could do this holistic rollout that you saw him do on April 6th. He really wanted to make sure that he had the ability to put the whole story out before it started getting picked apart because of a specific piece of information leaking. Quite honestly, that's no different than the normal embargo on budget decisions that we have associated with DoD budgeting. So -- but -- now, look at what really happened. This secretary reached out more strongly to the combatant commanders than I've ever seen done. The Service chiefs were part of all these discussions, and none of them are shrinking violets. They all spoke up. The COCOM involvement in the large-group sessions that the secretary hosted was larger than I've ever seen. So they were key participants. I expect, in fact, that that emphasis by Secretary Gates is going to continue through the QDR. He's already reaching out to them in a way that we haven't seen before. So in my mind, that's -- they were not intimidated at all. Q You’ve been here under the Rumsfeld regime, too, when a lot of military officers were frankly intimidated by his operating style, even though they didn't admit it publicly. Where you -- from where you sit now, are you concerned that military officers going up and testifying will feel intimidated when they're asked, "How was this put together? Did you agree with the recommendations? And what would you suggest differently?" VADM. STANLEY: I would expect the Service chiefs to provide their best military advice to the Hill, okay? There are things for a specific Service that they would disagree with, but from a holistic approach, the chairmen and the Tank, so the Service chiefs, were supportive of the secretary's decisions. MR. HALE: Definitely not. Definitely not. MR. HALE: I mean, I'm new to this building, but I didn't, certainly, notice it during this process. He went through a series of small-group and then large-group meetings that included all the senior military and senior civilian personnel. They spoke up, sometimes aggressively, and there was a good debate. I don't see it. MR. HALE: I don't sense it. Q What exactly do you have in mind for the presidential helicopter? What's the next step? And how do you foresee saving money by potentially putting money into upgrades and restarting competition when you've already spent $3 billion -- or more than $3 billion on this one? MR. HALE: Well, as economists say, sunk costs are sunk. We won't save that. But going forward, we need to keep better control of the requirements, which I think ran amok with this weapons system. And it's probably the key way that we can both provide good, safe and adequate transportation but hold down the costs for the future weapon. Q Are you restarting a competition? Are you starting a request? MR. HALE: Yes. Well, we're restarting the requirements process to develop a proposal that would then be available for competition. Q And how much are the termination -- how much are you going to pay for the cancellation of the contract itself? MR. HALE: We don't know yet. Those are going to be subject to negotiation. They always are. MR. HALE: (Laughs.) That counts. Q Since the admiral brought up the V-22 as a potential CSAR candidate, what about for the presidential transport? Could the V-22 be a candidate for that? VADM. STANLEY: Who knows? What we're going to do though -- I mean, the issue there is, what is the requirement? We're going to work with the White House, to try to better define that, do it from a more fiscally informed perspective and what we can actually achieve from technology. You know, one of the key constraints of the VH-71 program was to provide the president with lift, you know, helo capability that had already been well tested, had numerous hours on it. What we found we were doing was designing a new aircraft. So one of the key constraints that the secretary considered was, hey, we've got to go back; we've got to go rethink this, because that is a valid concern. We want to make sure that we have something that's very reliable to transport the president. Q So may I just follow up on that? So you're looking for an existing aircraft that's fully tested, has a lot of hours on it. VADM. STANLEY: That's one of the key constraints. Whether or not that will survive in the -- we'll have to balance that against the desire for range, endurance, those types of things, to see where we set out, in negotiation with the White House. Q (Off mike.) Because of the way this program went, will going through the new requirements, et cetera, be sped up in any way? MR. HALE: We're going to. We've already funded the necessary resources to sustain today's fleet. So we're not going to rush this. Q Sir, you mentioned, regarding cyberwarfare, that we need an offensive capability. Can you expand on that? MR. HALE: Not much. One, I don't know a lot about it. And two, I suspect I'd be climbing into classified areas. But I think it stands. I'll stick with my statement. I think defense is key, but we probably need an offensive capability as well. Q Is there anything in the budget that you would direct us to? MR. HALE: I'm not going to direct you to anything. Q Is that Service-specific? Because the Air Force is sort of, I guess, responsible for that cybercomponent. MR. HALE: I'm going to let them speak to that. Steve, do you want to address that? You know, there's an ongoing cyberreview that the administration is starting to get close to completing. We normally call it the 60-day study. During that review, we're going to try to define some of those areas. But we haven't made those decisions yet. What -- in my mind, each of the Services today have a cybermission, right, to support the networks that they have out there. So they're all doing cyberdefense or all doing cyberoperations. The idea of cyberattack is something that, you know, needs to be sorted out, as part of this review, and defined. But right now all the Services are doing cyber. 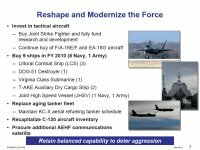 Q Why are you not funding the alternate engine for the JSF program? MR. HALE: Because we don't think there's a business case for it, in terms of overall savings for the same capability. Q But Congress has repeatedly, you know, pushed the Pentagon to do this. Does it make sense to, at some point, call it quits on the argument? MR. HALE: Well, I mean, I think, our job is to propose what we think will provide the most national security for a given amount of money. I understand Article 1, Section 8. It's an independent branch of government. And they have the right to ultimately appropriate the money. But I mean, maybe there comes a day. But at this point, I think, that's the right thing for us to do, which is to continue to propose what we think is in the best interests of the country. Q On the unfunded requirement question, Secretary Gates has written, to the Service chiefs and others, asking them to come to him first, before going to Congress. VADM. STANLEY: The simple answer is no. 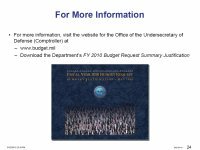 I'm not aware of unfunded requirements that have come up. I expect that there will be some, okay, and I expect -- you know, all the secretary did was not to preclude them going forward but to say, make sure that I understand what it is, you know, so he can work it into the follow-on processes. MR. HALE: I've seen one COCOM that has submitted some. I have not seen any of the Service ones, but I think, as Admiral Stanley says, there will be. Q What were they seeking? MR. HALE: You know, I think that this one, as far I'm concerned, is pre-decisional until they actually send them on their own as the military head to the Congress. MR. HALE: Yes. We are not this year seeking increases in TRICARE co-pays or premiums. But I also understand and know all too well that military health care is eating our budgetary lunch. Like so many countries -- or companies in this country, we've got to find a way to work with the Congress to provide high-quality health care and slow down the rate of growth. We're doing that in a couple of ways -- through this Quadrennial Defense Review, focusing on efficiencies first -- are there ways that we can slow the growth that way? But at some point we need to work with the Congress to end the freeze on co-pays and premiums that really goes back to the late 1990s. Q Getting back to the presidential helicopter -- how much has been spent on the program to date? And I believe that five of the helicopters are going through operational testing. Will those be used? Will the whole thing be shelved? Can you give us a sense of that? MR. HALE: I don't know the amount that's been spent to date. I may need to defer that to one of the Services. ADM. STANLEY: You could take that really up with the Navy during the Navy breakout session. MR. HALE: I think we are still working on what happened. I mean, the secretary said they didn't want to go forward with increment one. But I think we still need to work through the specifics of what that means, to be candid with you, and I don't know the results. I can take two more questions, I'm told. Let's go to the back of the room. Q You know that termination costs have to be negotiated, but have you put any kind of placeholder in the budget here to account for that when they come down -- when they come out? 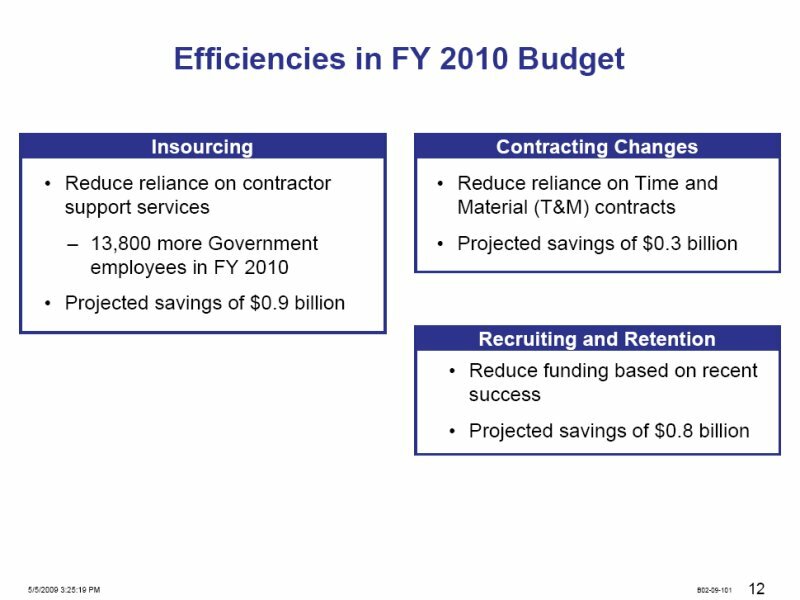 And also, on the hiring of government personnel to replace contractors, how much are you going to save on that? And why does it cost less? MR. HALE: Well, first, on the termination, yes, in general, we have tried to. It varies by program. I mean, we always try to have a placeholder. But we also understand that they are subject to negotiation. We just have to work through it. They usually take place over a number of years. In terms of savings, I mean, we're looking for selected cases where you're going to employ government -- contractor personnel, or would otherwise, over a long period of time. Then you're paying all their overhead costs, bid costs and all that allow them to come in and out when they have to. If you know you're going to continue doing it, you're probably better off with a government employee, because you won't pay those overhead costs. On the other hand, if you think you may need the capability for six months or only a year, you're probably better off with contractors. So we got to look at selected cases. Q How much are you setting aside for termination? MR. HALE: Well, which one are you talking -- I'm not sure I know all of them -- which one were you talking about? Q For all of them. MR. HALE: Oh, that I don't know for sure. It would vary by program, and I certainly don't have that number in my head. I can take one more. Way in the back. How about that? Q Thank you. Your troop deployment requirement is dropping, yet you still increase the size of the ground force. Can you explain the reasoning behind that, why you decided to go ahead with that, realizing that personnel costs are your biggest costs right now? MR. HALE: Well, we're not increasing it beyond plans of a couple of years ago, 547,000 in the case of the Army active duty. It's not going beyond that. And, you know, at the moment we are really swinging those forces from Iraq to Afghanistan. Now, they will come down over time as we get out of Iraq. We're also at dwell times -- that is, the time at home versus the time overseas -- that are too high. They need to have these troops with more time at home. So I think overall, at least for the moment, we believe we need that full end strength in order to accommodate the outlook for foreign contingencies. Let me ask one request to you in the end, and that is, we are trying to get out the message that we are trying to change the Pentagon to move toward more irregular and unconventional war and change the way we buy equipment and services. So I hope you will help us let the American people know that that's our goal. And thank you so much for being with us today.